A Goals Statement: which will clearly indicate what you hope to accomplish in your OPLN. A Defined Scope: brief narrative that can help define the scope of where you will be culling your resources. A Resource Network: essentially, lists of resources that meet your goals and scope. The network should be diverse, comprehensive, and include from a wide range of types of resources, from e-mail listservs, to Facebook groups, to Twitter hashtags, websites, etc. A Network Maintenance Plan: This will provide answers to questions such as: How will you maintain your online professional learning network? When will you adjust it? At what points will you actively add to it or delete from it? Is there a particular type of technology that you will employ to make the best use of your network? Will there ever be a point where you would create a new plan from scratch? The deadline for the assignment is Sunday 17 November 2013. When I first registered my interest in participating in this MOOC I was working at UKOLN, a national centre of expertise in digital information management based at the University of Bath. However JISC. our funders, had announced the cessation of our funding and so I would be redundant from 1 August 2013. By the time the MOOC was launched, in September, I regarded the MOOC as providing an opportunity for professional development and for gaining greater understanding of MOOCs which would, I hope, prove useful in a new job, if I was successful in finding a new job. I’m pleased to say that I was successful in finding a new job and started work at Cetis, University of Bolton on 28 October. Cetis is a national centre which was also funded by JISC but was more successful than UKOLN in obtaining further funding for the organisation. My job title is Innovation Advocate, and I will have responsibilities for encouraging takeup on innovative technologies and approaches, especially those relevant for the support of teaching and learning. I will therefore for a requirement to further develop my online professional network. This will be particularly relevant as I will be a home worker and will not have the regular stimulation which the physical proximity in working with one’s colleagues can provide. This assignment is therefore very relevant to me and comes at a timely moment! My online professional network will provide a soundboard for my ideas, a way of finding out about what my user communities may want and what they find interesting, a means of helping to identify new funding opportunities and, last but not least, a way of having fun in my professional activities and ensuring that my work is interesting and stimulating. I’d welcome feedback on this goals statement. Cetis is the Centre for Educational Technology, Interoperability and Standards. Our staff are globally recognised as leading experts on education technology innovation, interoperability and technology standards. For over a decade Cetis has provided strategic, technical and pedagogical advice on educational technology and standards to funding bodies, standards agencies, government, institutions and commercial partners. I am looking forward to working in the area of education technology innovation, interoperability and technology standards and exploring ways in which my skills, expertise and professional networks can be used to support and enhance Cetis’s activities. In addition to my work in these areas I will also be looking for new funding opportunities which may include exploring new areas of work. In order to put some flesh to this broad summary I have identified the following groups which I will need to engage with in order to support my work at Cetis. Staff at Cetis and the University of Bolton: I have already made contact with a number of my new colleagues. In addition I have been in touch with the IT services director and a professor at the University of Bolton who I have met briefly previously. In addition to strengthening these links I will look for other key contacts within the university. Key national event organisers and committees such as ALT (e-learning) and UCISA (IT Services) and SCONUL (libraries). Funding bodies, which will primarily involve engage with staff at Jisc but may also include the EU. The e-learning community: my Cetis colleagues will be able to advise me on key contacts, organisations and channels. The standards community: I have links with the W3C community. My Cetis colleagues will be able to advise me on key contacts, organisations and channels for other relevant areas including learning standards. The accessibility community: I have strong links with web accessibility researchers and practitioners across the UK and additional contacts in Australia. The learning analytics community: this is a new community for me. The openness community: this will include those working in the areas of OER (open Educational Resources), OEP (Open Educational Practices) and Open Data. Members of institutional Web management teams. It would also be useful to cultivate links with members of the media, ranging from broadsheets, such as the Guardian, sectoral newspapers such as the Times Higher Education and professional journals. I appreciate that such contacts could be regarded as being part of a professional dissemination rather than learning network. However I have found that discussions with journalists, writing articles for the mass media and giving interviews of the radio can be helpful in ensuring that you have a good understanding of the subject you are talking about and can respond to concerns about limitations in a way which is easily understood by non-experts. I therefore feel that it is legimate to include the media in my Online Professional Learning Network. Having identified some of the communities I will be looking to engage with there is a need to identify how these links will be made. Ye Olde Man & Scythe, one of the ten oldest pubs in Britain. Some of the connections will be by face-to-face meetings, both formal and informal. This will be particularly important in getting to know my new colleagues within Cetis, Although I have already arranged a number of Skype meetings it will be important to have face-to-face meetings in order to get to know my colleagues better. 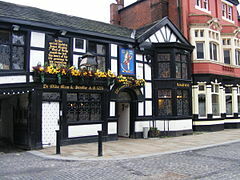 I have already found a good pub in Bolton (the Ye Olde Man & Scythe which, according to Wikipedia “was first recorded by name in 1251 making it one of the ten oldest public houses in Britain“) which is popular with some of my new colleagues – this could well form the basis of my DPLN (Drinking Professional Learning Network!). But this assignment requires details of one’s focus Online Professional Learning Network. I will therefore summarise some of the key network resources and services. I will start by mentioning Skype. Skype is used by Cetis staff for online meetings and so will be part of the repertoire of tools I use to support my work. It occurs to me that I should investigate whether there are aspects of Skype which I may have limited expertise of (e.g. sharing desktop applications) or Skype extensions which may provide useful (and should I get a Skype phone number so that I on’t have to divulge my home phone number? ), However I’m mentioning Skype first because as I was writing this post I noticed one of my Australian Skype contacts had appeared online. I had not previously configured Skype so that notifications were displayed when they came online. However this option appeared to be the default when I installed Skype on my new PC. When I noticed my contact I sent a Skype message and had a brief chat on what we’ve both being doing since we were last in touch. This led to an invitation to give a talk at the OZeWAI conference in Australia next month! However the presentation will be given online, so I won’t be travelling to Australia. This fortuitous event made me realise that (a) alerts when contacts are online on Skype can provide an opportunity for making contact and (b) starting a new job provides an ideal opportunity to instigate a conversation. Twitter will for an important channel for engaging with my OPLN. However as illustrated in the example of Skype there is a need not just to identify a tool but also to document how the tool may be used. In the case of Twitter I intend to create relevant Twitter groups (e.g. CETIS-staff) so that I can easily view all tweets from the group.I will also follow relevant Twitter event hashtags which cover events of interest to me. I subscribe to many blogs. However I should use the start of my new job as an opportunity to revisit the blogs I subscribe to and the way I classify them. The process of identifying key individuals, groups and organisations will also provide an opportunity to discover and subscribe to associated blogs. I use LinkedIn as my interactive address book: as well as enabling me to have a list of contacts details for members of my professional network, my LinkedIn stream enables me to see details of changes, such as new jobs, responsibilities or endorsements as well as status updates, new slides uploaded or blog posts, if these have been added to my contacts’ profile. I will follow the Slideshare accounts for professional contacts who use the service. I will invite contacts with whom there is some level of personal social connections to my Facebook account. I will identify relevant mailing lists to subscribe to. In addition to these resources I will also explore tagging strategies which will make my resources and my presence on social media services easier to find and therefore easier for others to include me in their online professional learning networks. There do seem to be some name clashes for my organisation, Cetis, (e.g. the Centro de Estudios Tecnologicos Industriales y de Servicio and the Cetis, Graphic and Documentation Services, d.d.). However Cetis in Englash language resources appears to relate to my employer, so perhaps that should be the the tag I use with my resources. My new job will provide an opportunity to prune my professional network, removing Twitter accounts, blog feeds, etc. which are no longer relevant to my new role (unless, for example, I still gain value for the personal connections). The final instruction in the assignment is to “Post your OPLN to your blog as a post using images and media where applicable“. I recently came across a link posted by Beth Kanter, one of my Facebook contacts, to a post she had written on Celebrating Beth’s Five Years As Visiting Scholar at the Packard Foundation, The post included an image depicting her “reach as a visiting scholar at the Packard Foundation from 2008-2013”. In addition to the static image it was also possible to access an interactive image, which had been created using the coggle.it service. I felt the publication of this post would provide an opportunity to try this tool which was new to me. The coggle.it visualisation of the online professional learning network is now available and a static representation is shown below. I’d welcome feedback on my plans for the development of my online professional learning network in my new post. This is awesome! I am going to reference your post as I work on mine. I like how your goals statement includes your user community. I hadn’t thought of that when I started working on my goals, I was more focused on professional learning and the LIS community. I also enjoyed your mind map and hope to implement something similar in my post. Thanks for the comment. I’m pleased you found the post useful. There’s always a temptation to delay publication of assignments till the last moment, as you feel that there might be additional useful things to add. However on this occasion I decided to publish early, in order that others might find it useful – and I might find how they built on my ideas useful to me too. I’m looking forward to read your assignment. Brian – Congrats on the new position! The visual representation is outstanding! Congratulations on your new position at Cetis – well done! And good to see the hub of your DPLN will be at Ye Olde Man & Scythe. Your OPLN is detailed and it looks like you’ve thought of everything. Thanks for sharing coggle.it. and producing such an appealing vision of your OPLN. Best of luck in your new role. Thanks to share the coggle.it service ! What an impressive piece of work. Loved the info about the pub, and the visualization map demonstrates the power of a new tool. Hope I can do half as well with my assignment.